I put decorations for all holidays in my bay window and I had this before and used it all the time. It was now time for a new one. 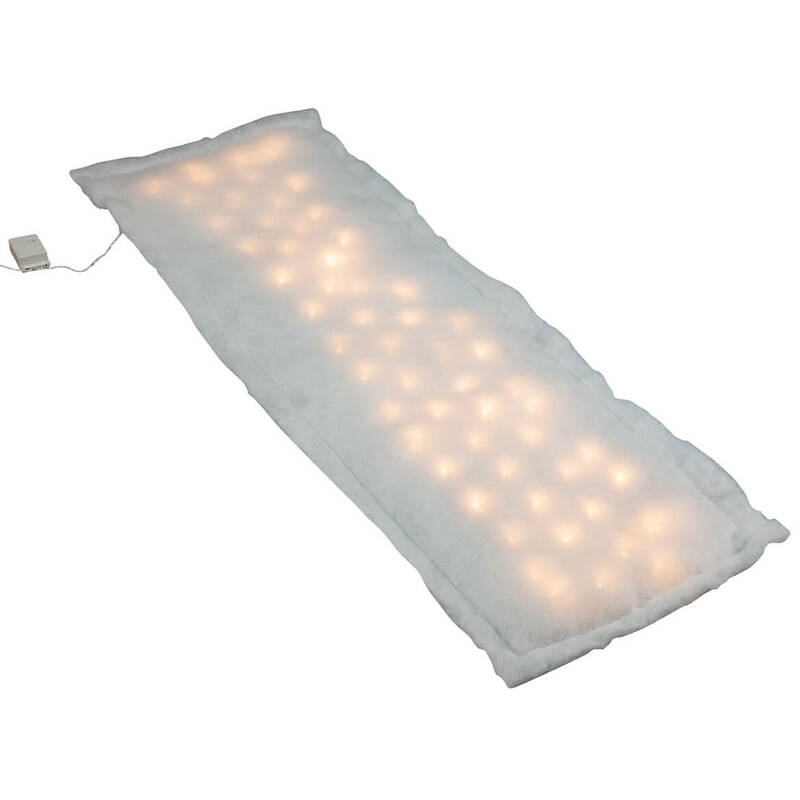 This lighted runner is awsomely beautiful! I bought this to give a lighted snow glow for my Thomas Kinkade Village and I love it so much. I would buy it again if needed. I hope it lasts for many years as it is beautiful. I like my purchase because it is electric and less expensive than using those with batteries. Also like that it has different settings to run lights. Fun lights for my small village. I am using this table runner as "snow" under my Christmas village. It is so festive and fun because of its many settings. The varied light patterns are great. My Christmas village will look great on this runner. Just the right size and the houses will lay flat instead of toppling over from other snow type designs. On my sofa table with my village scenery and looks wonderful!!! very pretty when lights are on with the city building and people on it. Having put strings of white lights under a white, snow-like cover for several years, this is a great improvement and works beautiful on top of my lawyers bookcase where my carolers are singing their heads off! I am using the runner on top of the entertainment center. With a Church on top and snowmen figurines. Striking! I am using this snow blanket for a display of Christmas items, and it looks lovely! I purchased one of these snow blankets about 10 years ago and it is still working! I love these lighted runners. I use one all winter long to put my ceramic horse and sleigh on. They are a nice winter decoration. The lights look so pretty through the snow. I wish they lasted longer is the only thing. I can get about 2 or 3 years of winter use out of each one which I guess is good. I have them on a timer so they come on at the same time every night from December to March. The ceramic piece I have on them is a bit heavy so that might be why the lights don't last longer as well. i think they would look cute with a village setting on them as pictured as well. I have bought several of them over the years and am still happy with the look. Perfect size and just the right touch for my snowman display. Had been looking for something like this for quite a while and this is exactly what I needed. I use this at Christmas time mostly. It lights up my little village and manger scene. Just what I have been wanting! These runners add so much class and beauty to decorating! This runner makes setting up a Christmas Village so easy. I love it. I used this item to showcase a winter scene on my sofa table and absolutely love it. I use it every night as a sort of nightlight. The lights do flash and the bulky plug-in gets warm so I would recommend no more than a couple of hours use per night but overall, a great buy. This item will be great for my Village display. Very attractive under Christmas Scene, houses and such. Nice and bright. Wish cord was longer though. However looks good and festive! I have one table runner on my coffee table with skiiers, sledders, and the ice rink on it and I threw some Dept. 56 suitable building on it. I love this effect, it is so Wintry looking. The lights change pace, if you push the buttons correctly. I would have liked it a bit wider and bigger for my piano, but I have lots of trains and cars and a Depot to make the extra space. Very pretty product under my fairly lightweight Christmas park items. Heavier items lie flat; others are a bit "bouncy" on the thick white material, but still looks like a natural snowy setting! Looks great when lit in a darkened room! Nice gift to put under little pine trees, a lighted log cabin, Santa on his sleigh and reindeer. Very festive! I used this under my Christmas Village scene. It is very nicely made and easy to store and use. I was suprised because of the many lighting features it has. I choose one I like and left it that. Very nice. I will use it again and again. Perfect size and so easy to use in place of the old angel hair! Been wanting one of these for a couple of years, so when it was offered at half price I excitedly ordered. Regular price I may not have been satisfied because the cord is not long enough and it does not have an on/off switch which requires you must plug in and unplug the heavy adapter each use if you are not using a multi plug serge protector. There is also a quite noticeable stitched seam around the edge that is placed about 2" in of which I am not a fan. The light strand is not sewn between the snow layers as I would have expected, but instead held in on the bottom by a netting. The option to choose light patterns is a plus and the quality is fine. At a sale price, it is worth the purchase, and will highlight my Village Display. great for under a christmas city, really adds nice lighting. Used under my snowmen, which made it more festive. This is very pretty when lit. I just hope it gives me good service and lasts for many years. Love all the light changing functions but it's not a bright white snow.. It's what I call a dingy white like it needs to be bleached. My Christmas village has very small windows and cannot be lighted. This does a great job of showing it. I bought this to use under my collectible houses that I put out at Christmas. I love the variable light show! I collect Snowbabies and am using this as a backdrop under them. It really showcases the display and highlights it. I'm very happy with it. This is a really pretty item except too many light choices. You should be able to set the choice you want and turn it off and it come back to the same setting, or have it on a timer feature each night I have to reset. Very nice way to display my grandfather's Nativity scene! Will have to see how durable it is over the next few seasons. love it! ordered 2 this year. I will use this under my Christmas Village but will still need to use the white snow blankets I've been using as this is smaller. I am anxious for next November to arrive as this will add so much. I ordered after the holiday this year. I tried to find them locally but no one carried them. Only lasted a couple years. Quit lighting in second year. Also wish it was a little bigger, doesn't completely cover buffet under village. Would have recommended it if hadn't quit on me! It looked nice so anxious to see if it will add to my village! I had one before and the little wires came loose. My husband has been wanting a Christmas Village for as long as I can remember so I decided this is the year we will start building one. This runner is the perfect base. I decorate our large Christmas Tree with all of our Family names , including children, grandchildren and Great Grandchildren. My great Grandson twins were just here from Wisconsin and were excited to see their names on the tree. I use all colors, and our names are in gold. My families love this and guests also find it neat! I don't put up a Christmas tree anymore...... instead I decorate my dinning room table. I think this will look great in the middle with a couple of reindeers and angels. I am decorating a dinner party and the theme is winter wonderland - snow. I will have a lot of snow items around the room and this will be at the check in table. It would look beautiful on my fire place. Saw it at a friends house looked beautiful! I know that my village will look so much better. I have been looking for this to put under my dreamsicles. Love this matt lights up my Christmas Village pieces. I have a Christmas Village and these should be great under it. I have a runner like this, but most of the lights are burned out and I ‘ve been looking for another one. So happy to have found this! I have a large Christmas village that I put across my mantel every year. I thought this table runner would enhance the village's appearance. It will be perfect on my mantel with my Naivety setting. To use under my village houses for more effect..
needed to brighten up a dark area. Had several; however, after 5 years of use cords pulled out of connection. I use this under the fabric used for setting up my nativity scene. Will fit my coffee table to set my angels aglow! I BELEIVE IT WILL GO WELL WITH MY NATIVITY SET. Love the pre-lit snowy runner! I'm sure it will add the perfect touch to my holiday village. Thank you, Miles Kimball! I am hoping that this is electric!! My snow had to be thrown away last year. This will replace it. I plan on making a winter wonderland scene feature for Christmas & this will be the beginning of that, so I can make a holiday tradition for my grandkids. I liked the idea of this under my Nativity this Christmas. I ordered one years ago from your catalog and some other Christmas decor. I really like your products they are very unigue, I still have them. I have a display of snowmen. I thought this would make it look prettier. Think i’ll Use this next year for the Dessert Auction at our church where the women alone can raise $14,000 in 2 hours for missions!! This is perfect to complete Christmas displays on a mantle or buffet. Will I need to buy 2 because 1 is no long enough to go completely across my fireplace mantle? BEST ANSWER: The table runner is about 42 inches. My mantle is about 66 inches so I used it on an accent table that I have against a wall in the same room. It worked really well and I've had a lot of compliments on it because it does have a few different light modes, e.g. flashing fast, fading in and out, etc. or you can have steady lights. For a mantle you may need two and have to overlap them and the depth may hang over the mantle which you would probably want anyway because my mantle is only like 8 inches and I believe the table runner was more like 12? Very pleased with it! You will need to measure your fireplace mantle and decide if it is long enough. I have mine on a wooden side board/buffet. It was a little shorter than the buffet so I put a white cloth under it that covered the entire buffet. The lighted snow table runner fit right in and looked great. I have been very happy with mine and I have used it for the second Christmas. I used mine for a counter between my kitchen and dining room. Ordered one last year and it wasn't enough. Ordered the second one this year and it's perfect. Only thing I ordered 1st one ran on electric, second one was battery. Prefer electric. Some are saying they like it, but wished it didn't blink. In the description it appears you can choose 'steady'.... I'm assuming that means 'steady light' (not blinking). Is that the case? I don't want to buy unless I can have just white steady light. Thanks for help. BEST ANSWER: You have to keep clicking to get the steady white lights. It will go through a series of twinkling, flashing, lights and the fade and then steady white lights. I have used it for the past two years on steady white. Hope this helps. I have found when I unplug it then I have to go through the series again. You can stop it from blinking to steady light, but then it fades, then brightens up again. It keeps doing this on this setting. I've had mind for 2 years now and really like it. You can have steady lights on the runner. You can choose from about 5 different settings. I would recommend this table runner to anyone that wants one. There are 8 different light combinations which does include just a white steady light. I also like the slow fade option. Is this runner fixed where you can tie in with another one? I have a long shelf I put Christmas decorations on and I'm gonna need more than 1 runner. BEST ANSWER: No, it doesn't have end to end connection. You could use an extension cord or outlet strip to plug both transformers (one transformer per runner) into. Hope that helps! There is only one power supply per runner. If you had a power strip, you could probably run them end to end and plug them both into the power strip. Sounds lovely. Thank you for your question. The runner can not be attached to another runner. We hope this information will be of help to you. I have only one, but I don't see any reason you couldn't just lay them end to end. Looks really pretty, too. No - it is a separate unit. Is this battery operated or electric? BEST ANSWER: Electric just be careful of the wires because they can be pulled out very easily breaking the connection. I bought the lighted snow table runner. I can't get it to stay on the steady lighting. It starts staying and then several minutes changes itself to cycling through all the options. What should I do? Keep pressing the button on the control box until you find the lighting you enjoy. Are there instructions that come with this item, to tell you how to manage the lights ? BEST ANSWER: Thank you for your question. The runner is a seasonal item and will not be back in stock till the Holiday season. We hope this information will be of help to you.